Chronic deficiency of kidney qi and yang causing lower back pain or weakness, weak knees and urinary dysfunction. 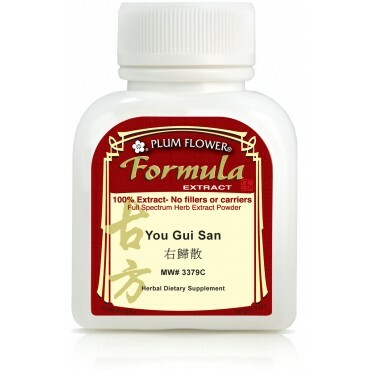 Yang deficiency causing male impotence, female infertility, cold limbs, edema, poor digestion and loose stools. Coronary heart disease, toxemia during pregnancy, chronic nephritis, hypertension, prostatitis, lupus and Addison's disease. General tonic for aged and following illness. Can be taken for long periods of time are some of the imbalances satisfied clients have used this product for. Rehmannia glutinosa root-prep, Dioscorea opposita rhizome, Cornus officinalis fruit, Lycium barbarum fruit, Eucommia ulmoides bark, Cuscuta chinensis seed, Angelica sinensis root, Cinnamomum cassia bark. - Shu di huang, Shan yao, Shan zhu yu, Gou qi zi, Du zhong, Tu si zi, Dang gui, Rou gui.